When you access the pages LEVA-ME (Fronteiras e Colinas, Lda) you agree to the terms herein. All personal information collected will be used to help making your visit to our website as productive and enjoyable as possible. All copyright, trademark and other applicable or used on this site are owned by LEVA-ME (Fronteiras e Colinas, Lda) and are protected by copyright. All rights not expressly granted herein are reserved content. This site is for personal and non-commercial use. The copying, modification, distribution, transmission, display, reproduce, publish, transfer or sell any of the information, products or services is forbidden if obtain through this website. LEVA-ME (Fronteiras e Colinas, Lda) is not responsible, directly or indirectly, for any damage resulting from or in any way related to the use of this site. The agency does not ensures that its Web pages will not have errors or other difficulties. The agency reserves the right to manipulate any information present on the site, without previous warning to justifying the reason. You are responsible for reviewing the content anytime you consult or book travel through it. After any changes are made, if you continue to use it, will be considered as an acceptance of those same changes. As a customer enrolled on a journey, you give express consent that all information, including personal data, provided in relation to your trip can be transmitted to government authorities for border control purposes and safety in air travel. The collection of user identification data can be carried out via the Internet (on site), phone, email (only when the mail part of the domain “@ leva-me.com” or through printed. If You are registered in a tour, you give express consent that all information provided in relation to your trip can be transmitted to LEVA-ME (Fronteiras e Colinas, Lda) local partners to carry out the travel program, food preferences, private health information or other. 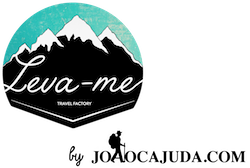 All data collected through registration in LEVA-ME (Fronteiras e Colinas, Lda) are entirely confidential and are for customer management, services and marketing activities of our company (leva-me.com and joaocajuda.com). Thus, all data from your registry are entirely confidential and will be only used to make you receive our news, serve you as best as possible and create offers that suit your interests.